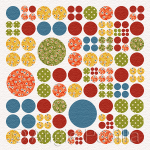 Bright, bold colors make this a stunning quilt. Contemporary nine-patch star blocks are just as easy to piece as the traditional block, but a few twists and turns give them a truly modern spin. 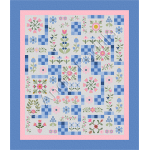 Complete it with an easy applique border, and you truly will have a quilt to be proud of! Finished size: 82 x 102"